Please DO NOT Buy from Other Sellers. if You Received a Purse without "HotOne"Logo and "HotOne" Brand Keychain,Sorry,You Bought a fake product, pls report to Amazon ASAP. 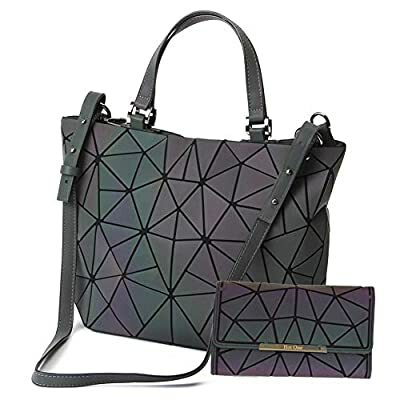 This is A geometric holographic purse,A Reflective Luminous Purse,A Holographic Purse. Color Will Changes When Light Hitting,Totally Different in the Day and Night. Geometric Shard Lattice Design,Made of Eco-friendly Artificial Leather. Easily Hold All You Stuff of Daily Use, Such as iPad,Cosmetic,books,Wallet,Phone etc. It's a Fashion Bags,Flexible All Your Dress. It's a Super Popular in Amazon,It's a Product of "Amazon Choice" . one Single Luminuos Purse of Medium or Large Size. To remove dirt, wipe gently with a damp, tightly wrung soft cloth and then wipe dry. Do not use paint thinner, benzene or detergent, etc. 1.Please store in a well ventilated place, do not expose to direct sunlight, heat or high humidity. This is A Unique Purse and Handbags,And A Perfect Valentine's Day Present,Great Gift for Girlfriend. It's a Geometric Tote With a Detachable Strap,Can be Used as a Shoulder Bag and Handbag. It's a Geometric Handbag With 3 Small Pockets,Easily Hold All You Stuff of Daily Use Such as iPad,Cosmetic,Umbrella,Wallet,Keys,Phone etc. It's a Fashion Bags,Flexible All Your Dress,Make You More Fashionable in Party or Date. It's a Super Popular Womens Purses and Handbags,Read The Reviews,You Will Love it,too..